The Knight's Cross Edition US $320. The First Edition in Robert Taylor's new LUFTWAFFE TRILOGY. 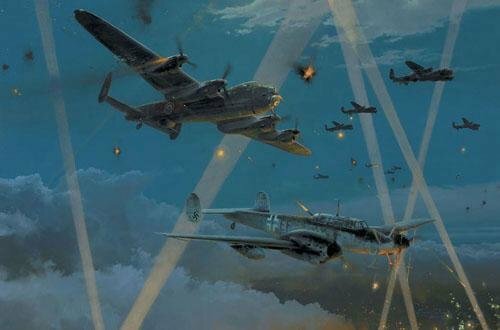 An exciting new limited edition by Robert Taylor portraying a daring attack by the Luftwaffe's top-scoring night-fighter ace, with prints signed by Luftwaffe night-fighter pilots from the era. The air war fought throughout World War II in the night skies above Europe raged six long years. RAF Hurricanes sent up to intercept the Luftwaffe's nightly blitz on British cities had no more equipment than the fighters that fought the Battle of Britain during the day, but as the scale of nightly conflict developed, detection and navigation aids - primitive by today's standards - were at the cutting edge of World War II aviation technology. As the air war progressed the intensity of the RAF's nightly raids grew to epic proportions, and the Luftwaffe night-fighters became a critical last line of defence as their cities were pounded from above. By 1944 the Luftwaffe was operating sophisticated systems coordinating radar, searchlights and flak batteries, enabling effective guidance to increasingly wily aircrews flying equipment-laden aircraft. But the RAF had in turn developed their own detection equipment, and the nightly aerial contests between fighters and bombers were desperate affairs. Night-fighter pilots were men of special calibre, requiring a blend of all the best piloting and navigational qualities combined with patience, determination, and no small element of cunning. They were hunters in the purest sense, constantly honing their skills, and pitting their wits against a formidable foe. The young aircrews of the Luftwaffe fought a brave but losing battle in defence of their homeland, but their dedication never faltered, and their bravery is legend. Robert Taylor pays tribute to this courageous and skilled group of flyers with his new painting Duel in the Dark. It is August 1944. As Lancaster heavy bombers of 106 Squadron approach the target, Major Heinz-Wolfgang Schnaufer, Kommandeur of IV./ NJG1 and the Luftwaffe's top-scoring night- fighter pilot, makes a daring attack passing feet below the mighty four-engine aircraft. Flying his Me110 night-fighter among the flak and searchlights he has scored hits on the bombers outer starboard engine. While his gunner fiercely returns fire from the bomber's front turret gunner, the night-fighter Ace will slip into the shadows before selecting another quarry. His night's work is not yet done. Overall Print Size 33" x 25"
The Night-Fighter Edition: Individually numbered 1-250 Complete with matching numbered colour companion print ‘ Night Attacker’ signed by the artist Robert Taylor.